home > preview > Gotta...Catch Some More?! Just when you thought the madness had come and gone, Nintendo comes back with four more games to add to the worldwide phenomenon that is their Pokemon brand. On September 28th, Japanese gamers will be introduced to Pokemon Diamond and Pearl versions, the latest in the monster-catching RPG series. Diamond and Pearl take place in an all new region of the Pokemon world where, as always, there are dozens of new monsters waiting to be fought and captured. Diamond and Pearl boast a lot of new features that\'ll make catching them all a lot more fun and further promote the cool features the Nintendo DS and DS Lite have to offer. Trainers will still be able to enjoy trading and battling with friends via the WiFi connection, but now a lot more people can join up together, and you can even have voice chats with other trainers as well. While we wait for these new games to arrive here (which will be sometime in 2007), Pokemon Mystery Dungeon Red and Blue will have an English language release very soon. In this series, the main character gets transformed into a Pokemon, and they must befriend other pocket monsters and create a rescue force. With your rescue force you\'ll go on the usual Pokemon quest to \'catch\' all 386 monsters in the series...or in this case, make friends with them. 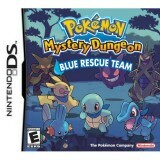 Pokemon fans who have yet to buy a DS or DS Lite will be thrilled to know that Mystery Dungeon Red will be released as a GBA cartridge, while Mystery Dungeon Blue will be for the DS. The games are pretty much the same, but DS users will get a few extra features that require use of the touch screen. It\'s pretty obvious that Pokemon fans will have a lot to look forward to in the coming months, and that we haven\'t seen the last of these cute and cuddly powerhouses.